The government has announced plans to change the make-up of energy bills to limit the pain of rising prices for consumers. However, Labour - which has promised a 20-month price freeze if it wins the next election - says that the plan is a "smoke and mirrors" deal with the energy companies. 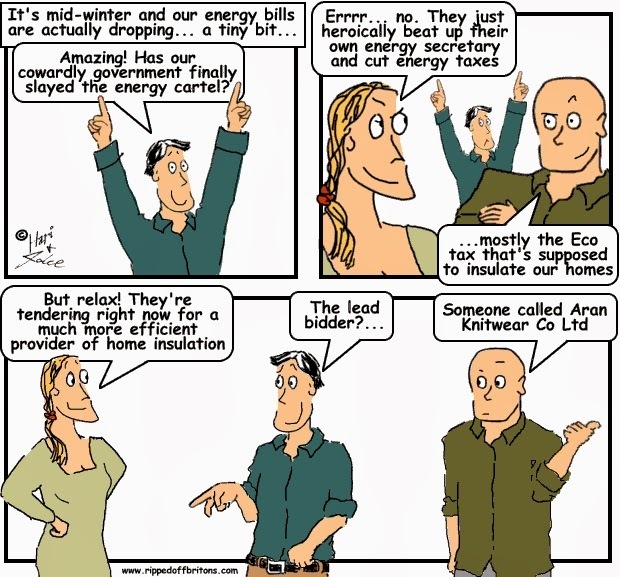 So what do the proposals mean for your energy costs? SOURCE BBC NEWS: Npower to cut energy bills by 2.6%The energy supplier Npower has announced an average price reduction of 2.6%, following the government's changes to energy bills. The price cut will affect all customers whose prices went up in December, including those on fixed, or discounted rates. Npower had previously announced the largest price rise of the big six, averaging 10.4%. It is the last to announce details of price cuts, which followed the government's decision to alter the green levies on bills. Three rival suppliers, E.On, EDF and Scottish Power have been criticised by consumer groups for not extending the price reductions to those on fixed tariffs. British Gas, SSE and now Npower have said those on fixed rates will benefit, alongside those on standard variable rates. SSE has been criticised for waiting until the end of March to cut bills. Nevertheless, according to price comparison site Uswitch, average dual-fuel bills on standard tariffs have risen, or will rise later in the spring, by an average of 4.3%. That is double the latest CPI inflation rate, of 2.1%. The Uswitch figures imply that E.On raised its prices by the lowest amount, 1.1%, while Npower had the largest price rise, at 6.5%. However, there is relatively little variation in cost between the six big suppliers, with just £62 difference a year between the cheapest and the most expensive.